While charcoal can be made from any number of natural materials, hardwoods such as hickory, mesquite, oak, maple, and fruitwoods are favored. They have unique aromas and tend to produce a better grade of charcoal. Better grades of charcoal come from raw materials with low sulfur content. 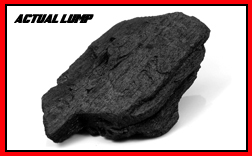 There are generally two kinds of wood used to make lump charcoal that can be referred to as "processed" and "unprocessed". Unprocessed wood is natural wood, such as limbs or branches and saw mill scraps. Processed wood refers to the kiln dried lumber scraps usually coming from flooring and molding scraps. This lends to less smoke because it is less dense, thus not lasting as long.